AoHeng DIRECT Anti-blue glasses: focus,With your heart,Better design,Better quality,Better price,only for you to get better service. AoHeng anti-blue ray glasses series, only make rimless glasses,only 8g,life is always accompanied by pressure.AoHeng hopes to reduce your wearing burden. 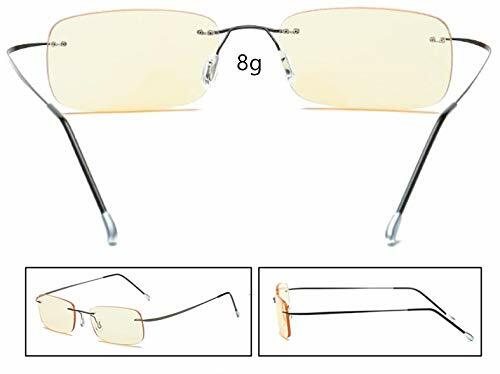 Thin silk elastic frame, not only reduces the wearing weight, will not have the slightest sense of pressure to wear, almost suitable for all face shape, the choice is simple, wearing comfortable. Maybe we're used to it, but we're just not trying to change it. AoHeng has been trying to change for you to get best service. The blue light can penetrate cornea and crystalline lens thus directly shoot the macular area, which can cause sore-eye, unsmooth-eye, eyestrain and even losing sleep. ANTI BLUE LIGHT - AoHeng glasses can cut the harmful blue light.Reduce eyestrain and headache.Give you a better sleeping. Super light, super soft, no compression, wearing very comfortable, like a dragonfly skimming the surface of the water. High quality, comfortable and easy to use; It is the eternal pursuit of AoHeng brand store to make products by heart.30 DAY MONEY BACK GUARANTEE - All AoHeng'S customers enjoy 30 Day Money Back Guarantee. Customers can return and get refunded in case the purchasing is not satisfactory for any reason. You have no risk to try and we will provide you the best service!